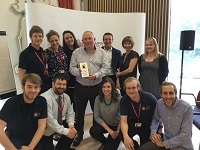 Hampshire Fire and Rescue Service has received a prestigious award to recognise the organisation’s communications team as the best across the whole of the public sector. The HFRS team won the UK Public Sector Communications (PSC) Award for being Large In-house Communications Team of the Year. It was also shortlisted for Best Use of Video, Media Relations Campaign of the Year and Internal Communications Campaign of the Year. Head of Communications, Administration and Inclusion for HFRS Paul Breakwell said: “We are honoured to see our talented communications team get this recognition for all the hard work they do in promoting the fire service to the public and our people within an organisation that inspires passion and dedication, and always strives to be the best. “Nationally, fire services – as well as the public sector as a whole – are facing challenging financial times. For our communicators, this requires more innovation, creativity and flexibility in delivering information and messages in a way that enables the service to move forward by ensuring our key audiences know what we are about, and are engaged in what we do. The judges said of HFRS’s communications team: “The fire and rescue service has clear aims and strategies enabling them to develop and engage with the public. A fantastic entry and worthy winner."